Roots of Change is a storytelling platform dedicated to the Alumni community of The Funding Network Australia. Here we share their stories of ingenuity, courage, determination, spirit, growth and the impact these grassroots organisations have had, as a direct result of funds and support received from The Funding Network community. Working with women in remote Aboriginal communities to develop inclusive, creative and sustainable enterprise-based initiatives. Enterprise Learning Projects (ELP) works in partnership with women in remote Aboriginal communities to develop inclusive, creative and sustainable enterprise-based initiatives that support family and community goals. They are seeking funding to provide mentoring and support for women in Minyerri community to enable them to establish and run a functioning arts, enterprise and culture centre. In May 2015, ELP pitched to The Funding Network and raised $29,000, along with a full day of pro-bono strategic planning with BoundRound. Enterprise Learning Projects (ELP) provides that information. They recognise that Aboriginal people are one of the most economically marginalised groups in Australia, and are improving this reality by providing support for women in the remote Minyerri community in the Northern Territory to build the skills and knowledge to navigate the economy and start businesses. With the help of TFN's funding, ELP has supported the Minyerri community to incorporate the new Minyerri Arts and Cultural Centre as an Indigenous Corporation. The centre is now producing a range of products including a colouring book. 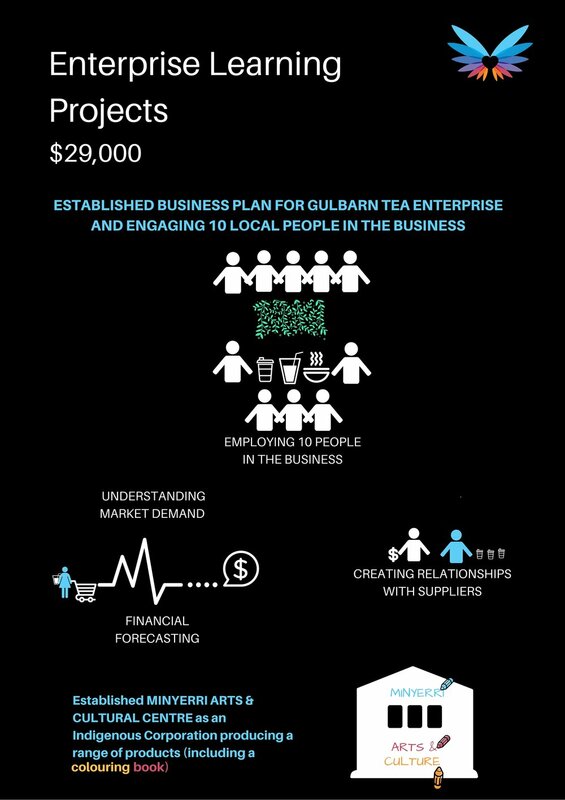 The TFN funds have also contributed to the excellent success of Gulbarn Tea, establishing foundations for the business to ensure its growth and positive impact on Minyerri community. ELP prepared a business plan and business model as part of this process and supported Samara Billy, the lead entrepreneur of Gulbarn, to understand the process of developing the enterprise. The business is poised to generate significant sales income and employment opportunities 2016-17 and Minyerri bush tea has already made its way to the hearts (and pantry cupboards) of many Australians. TFN support has coincided with exposure to tea industry experts and the development of business partnerships through which the Gulbarn Tea enterprise is now thriving. Learn more about Enterprise Learning Projects. Roots Of Change captures the ingenuity, courage, determination and growth of The Funding Network Australia's Alumni. These are the stories of grassroots organisations and the impact they have had, as a direct result of funds and support received from The Funding Network community. To support The Funding Network or any of these organisations get in touch with us.